I would like to share a bit overview and steps taken to perform third party applications updates patching using ConfigMgr + Patch Connect Plus ( One of product developed by ManageEngine) and it supports more than 250* thirty party applications. Central Repository(Vendor site) is the place where all thirty party patches are available after testing and the patch connect plus will get the selected patches periodically and then publish to ConfigMgr server. From ConfigMgr Console, we will deploy the patches to the machines. I have configured WSUS & SUP in the ConfigMgr site server and I am going to install patch connect plus plugin on the same server itself. Download the trial version of Patch Connect Plus setup from the below link and install the plugin. Once it’s installed. we can open Patch Connect Plus on the notification area of Task bar. Patch connect plus will open up in the webpage as like below and login with the below default admin credential. 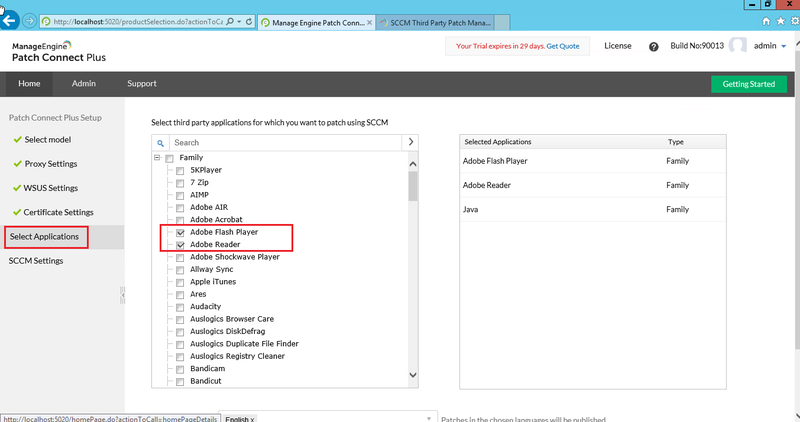 Select Model : Choose “SCCM Infrastructure” to perform patching through ConfigMgr. Proxy Settings : Specify Proxy server details if you have or else, leave it blank. WSUS Settings : If you have WSUS Server installed, it will detect automatically and no need to enter server details manually. Certificate Settings : In this step, you will get an option to Create Self Sign Certificate or Import Certificate (third party certificate). The certificate is used to sign patch binaries. The self signed certificate will be stored in the below location on the server and it’s mandatory to import this certificate to ‘Trusted publishers‘ and ‘Root certificate authority‘ stores to all managed computers. Please refer the below link to deploy via GPO. Select Applications : Choose the required applications for patching. You can see I selected adobe applications but actually, I selected only “Java” application for testing. The below screenshot is just for your reference. SCCM Settings : SCCM server details has detected automatically since I have it on same server and you need to add credential to make the connection. Once you configured the above settings, Patch connect plus will start to publish the selected applications from Central repository which is hosted in Vendor Site to the Patch Connect Plus console. Please wait until Publish in Progress completes. Once it’s published, ConfigMgr and WSUS sync process will happen. Hope, we all well aware of how to deploy patches through SCCM like creating software update , creating deployment package and deployment . I just put couple of screenshots before deployment and after deployment. I have installed Java 8 Update 112 (64-bit) on one of my Windows 10 machine for testing. 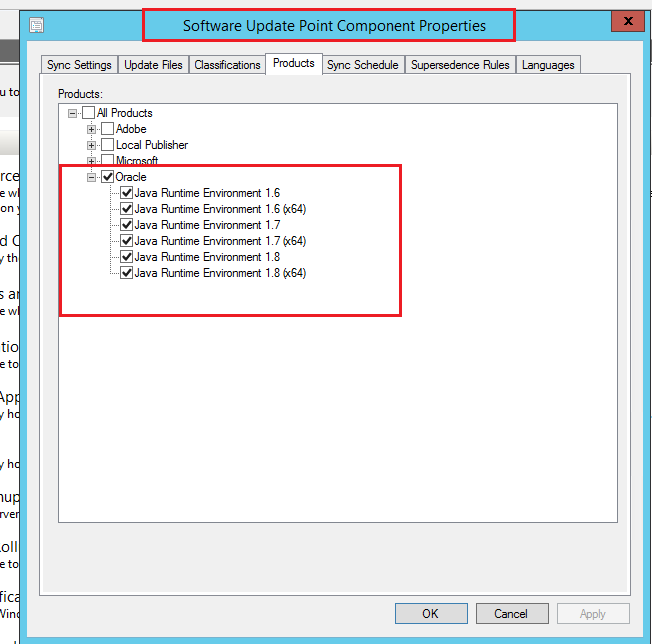 Deployed Java 8 Update 121 (64-bit) update through SCCM. There are still more settings available in Patch Connect Plus console .. like schedule , email alert configuration. etc. and you can use of it. Finally, thanks to Dixitha Srinivasan (Content Writer at Zoho Corporation) for helping me to write a bit information about this product. Hi Karthik , if we campare Patch Connect Plus with SCUP , which one would be better and why?